I've already given you the rundown on the bathroom we want to remodel and it's problems (click here.) The next step was to put our ideas down on graph paper. This is especially important since size is one of the major issues we have to deal with. I've done several floor plans. The first is the current bathroom and the others are the ideas we've been discussing. Please note that these are sketches and that the measurements have been rounded to the nearest inch. One graph square equals two inches. You can click on any image to biggify. This is how the bathroom is currently. This was an interesting exercise and I realized some things. For example, the reason the door can't open all the way is because of the quarter round moulding holding down the linoleum at the shower base. 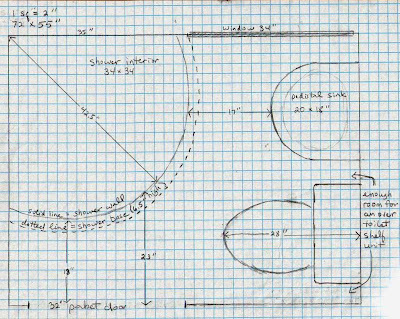 In all sketches I'm assuming a pedestal sink, so the number of inches refers to the actual distance between toilet and sink, and doesn't account for foot clearance under the sink. The sketch assumes the measurements in the brochures are accurate, and that I approximated the curve of the shower correctly. The glass on the shower surround is clear of course, which would also help the room seem larger. The width of the pocket door is arbitrary. The sink is pedestal, so there is still leg and foot room under it for sitting on the toilet. All our ideas require tearing down the shower wall in the middle of the room and moving the plumbing. Another major reconstruction would be putting in the pocket door, the width of which is yet to be determined. Combined with the rounded shower stall, it's placement here does give a narrower entry space in the bathroom. As you can see, this one swaps the toilet and sink. I also put in a wider pocket door; 32 inches is about the widest we could install in a 72 inch wall. This arrangement allows better leg room for the toilet, but I wonder about bending over room at the sink! 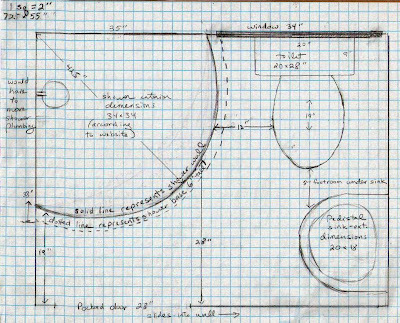 With this plan I would be able to have an overtoilet shelf unit, without blocking the window. Plan C - which is plan B with a corner sink. My only concern about this one is where to put the medicine cabinet and mirror! Has anyone ever used a bathroom with a corner sink? Is it weird having the mirror to one side? Still, this one offers the best free space of all. Accommodations would still be tight, but at least the occupant could change their mind without having to leave the room. It would be entirely feasible to use the corner sink with Plan A as well. And with a corner sink it is possible to have a small corner vanity instead of a pedestal because leg room won't be as great an issue, though that would be an added expense. The first three may not be strictly in that order, but they need to get done before we start in on the bathroom. Hopefully we'll get to that early this summer. Corner sinks would be the way to go, I think. As you say, you can always get a corner vanity under it, and what about a corner cupboard with a mirror door above it? Alternatively, how about a corner toilet? It does seem like putting something in that corner is the way to go. I haven't used a corner sink, but I haven't had a medicine cabinet in a long time - I keep things in cabinets below the sink. I spent a month in a house with few mirrors, and I really liked not having mirrors around. I like plan C! No problem with a corner sink. If you have to off set a mirror, then it becomes a decorating feature. We currently don't have medicine cabinets and it's not an issue. One can always find another place for those things. I like plan A but that's just me! Alison, I have to admit I'd never seen a corner toilet. Very clever for space saving. At the moment, we're planning to just use the old toilet, but if we change our minds, this looks like a good way to go. Thanks for the link. Sue, I have to admit that I don't like mirrors either, but DH insists on one over the sink for shaving! Nina, in reading all the comments, it's intresting to me how many don't have medicine cabinets. Dan seems to think they're standard bathroom issue, so I'll have to discuss this with him and see what he thinks. Bettina, your comment made me stop and think about why in the world they're called "medicine" cabinets. I can say that because we don't use any medicines other than an occasional aspirins. Still, the comments are making me evaluate it's use and I think most importantly it's a place for DH to keep his shaving supplies and a place for the toothpaste and tweezers. A drawer would do just as well, and that takes us back to a possible vanity cabinet. Personally I like Plan C the best. The corner sink give you a lot more room and would beeasier to use. You could always put an inset medicine cabinet on the wall to the right. This will make the room seem lighter, too. I like plan C or A-with-corner-vanity. Although more expensive, for me the additional storage would be well worth it. And I'm SURE corner mirror-door "medicine" cabinets are available; they ARE handy for toothpaste and brush, and shaving supplies. Certainly wouldn't need to be big, but I'm with DH, a mirror in the bathroom is necessary. Make sure hair is combed straight, all whiskers are off, no nose hairs sticking out, no spinach in teeth - hee! I like plan A with a corner sink...and I think I've seen corner medicine cabinets with a flat mirror which would work. You could also turn that toilet against the other wall so you can get a over the toilet storage that way. Deep End I agree C appears to be the roomiest. The sink will be in a corner where a wall meets the window though, so I think an alternative to a medicine cabinet is in order. Hmm. Benita you've given me an idea. A medicine cabinet with a mirror on the inside of the cabinet door may be an answer! Mostly it will be a place to store toothpaste, extra soap, that sort of thing. Michelle, *LOL. I like that idea too. I think the first thing to consider then, is how much actual leg room that would allow. Right now, we have to count on space under the sink to allow for knees and feet when one is sitting on the toilet. Sue, good point about the height of the sink. The one in there at the moment is only 29 inches high, way too low. The sink in the hall bath is 32.5", an much better height. I had to go back and check the height of the corner pedestal I'm considering, and it is listed as approximately 33" high, which is good. Renee, with plan A we could definitely have a corner med cabinet. Barring that, we need another idea. 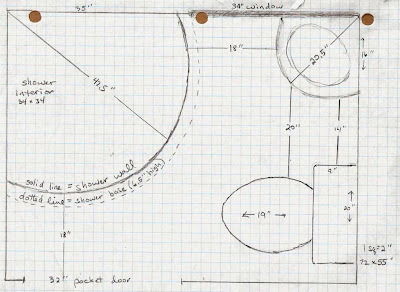 DH's first idea was to turn the toilet, but with the rounded shower, it only gave us 7 inches knee room! Ultimately it will be up to DH, because he's the who will do the plumbing. Other than that, we will probably choose the most cost effective options. I love love love graph paper! I'd go with DH's idea (B) and not put in a pedestal sink but a sink on (in?) a vanity: more storage and you can hide the pipes. That's what we did in our similarly tiny second bathroom. The problem with the mirror on one side (in plan C) is for DH's shaving. He'd have to do some manoeuvrings to get to the left side of his face, no? In plan A I think there might not be enough leg space in front of the toilet. Where is your heating coming from? 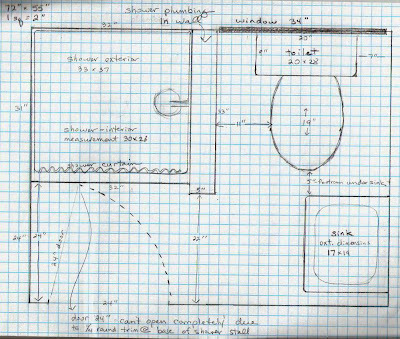 I like plan A but with corner toilet and a corner sink. You could then keep the window, have more space when sitting and still put a small base unit under the sink. Above the sink you could have a set of triangular corner shelves over which you fashion a door with a mirror for the main panel. I like Plan B. You can have a shower curtain rather than a solid shower door that will allow space in front of the sink for bending or pregnant women. Will you be able to recess the medicine cabinet? You risk bumped heads if using a small sink in a small space with a protruding cabinet. (personal experience) I wonder about elbows and a mirror for a corner sink placement. Seeing what you two decide on will be fun. Best wishes! I agree with almost everyone. I like Plan C too. I wouldn't worry to much about a mirror. You can always off set a long one between the toilet and sink. Katrien, you're a woman after my own heart. Your suggestion is a distinct possibility. In the end, I think cost will be the deciding factor. Heat will likely be from a combination light/fan/heat unit in the ceiling. Ideal would be plan B or C with a baseboard type unit under the window. That's still to be determined however. Karen, that layout would definitely give us the most room. However DH is not convinced about the corner toilet! I really like your idea of triangular corner shelves, which would work well with plan A.
Angie, we thought about a shower curtain. You're correct that bending is an issue and actually I hadn't thought about pregnant women. I certainly hope my daughter-in-law is pregnant one of these days. I agree about the protruding cabinet and shelves in such a small space in general. The current med cabinet could be inset, but that doesn't help with the mirror situation. Barb, maybe you have the solution to that mirror situation. Of course, there isn't a lot of inches between the sink and toilet, but it could be enough. We did a total remodel two summers ago. Major knocking out and moving walls to fit a jacuzzi tub. I would vote for plan C with the corner sink. We put a shaving mirror in the shower for hubby. It holds his razor, shaving cream, has a clock and a light...he loves it! Have a blast planning. Nezzy, a shower mirror is a great idea! Thanks! Actually I think planning is the funnest part (I know, I know, "funnest" isn't really a word.) Hopefully the reality will meet all our expectations. Looking at your small bathroom issues, I couldn't help thinking about people who live on boats, and how they handle having a really small bath/head. I think sometimes they have the entire room actually be the shower, i.e., there is no shower curtain or shower wall, and you position the spray so that it doesn't dowse the rest of the room. I'll be interested to see what you eventually did with this room. You know, that's one of the ideas we entertained, i.e. to make the entire thing into a shower. It would have meant tiling the walls and floor and putting in a drain. In the end, we opted for the easiest solutions!